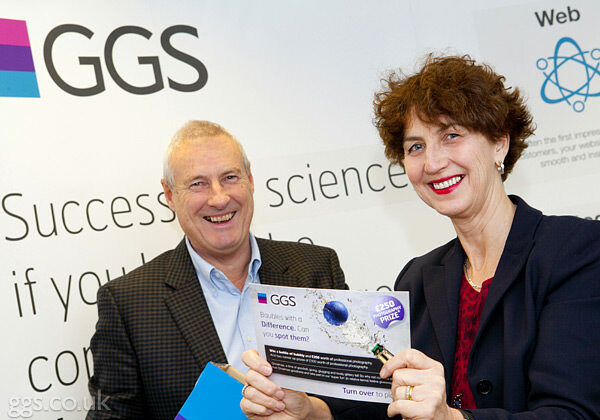 At this week’s Norwich Business Breakfast, run by Norfolk Chamber of Commerce, GGS ran a ‘Spot the Difference’ competition for everyone attending. It was a Christmas themed, fun, event attended by over 70 guests so we thought it was a good opportunity to bring some good cheer to three lucky winners. Seen here, Caroline Williams, CEO of Norfolk Chamber of Commerce, draws the first prize winner for us, accompanied by Photography Director, Peter Griffin ABIPP. The first prize was £250 worth of professional photography, to help the winner kick-start their 2013 marketing campaign. This, along with a bottle of bubbly, was won by Owen Morgan of Norwich conference venue, The Space on Roundtree Way. There were also two lucky runners up; Alex Thorpe of Towergate Insurance and Andrew Hirst of Word Perfect Print; each winning £100 worth of professional photography. Perhaps we can help you to get lucky next year! a) Stoppit! And get on with some work!